NASA's Solar Dynamics Observatory spacecraft captured this shot during a period of intense solar storm activity from Dec. 29-30, 2011. The sun closed out 2011 with a flurry of activity, and a keen-eyed NASA spacecraft captured the dramatic outburst on video. NASA's Solar Dynamics Observatory (SDO) watched as our star erupted in dozens of storms during a 36-hour period on Dec. 29 and Dec. 30. The probe's stunning video, taken in extreme ultraviolet light, shows spouts of plasma and intense flashes of radiation blasting from the solar surface. "Magnetic forces were violently pulling against each other, creating the frenetic activity," SDO researchers wrote in an accompanying update. "By pulling an image every two minutes, the level of detail we can observe is amazing." One medium-size flare is visible as a bright white flash about halfway through the new video. It's followed closely by a coronal mass ejection (CME) — a massive cloud of solar plasma that can streak through space at 3 million mph (5 million kph) or more. CMEs that hit Earth can wreak havoc on our planet, causing temporary disruptions in GPS signals, radio communications and power grids. But last week's sun storms don't seem to have caused us any serious trouble. It's not terribly suprising that the sun ended the year with a bang, because it had a very active 2011. After remaining surprisingly quiet from 2005 through 2010, our star came alive last year, spouting off numerous powerful flares and CMEs. 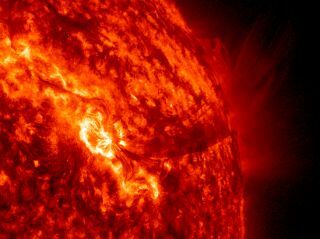 On Feb. 14, for example, the sun unleashed an X2.2 flare, the most intense one in more than four years. Then, on Aug. 9, the sun let loose a flare with a magnitude of X6.9 — meaning it was more than three times stronger than the Feb. 14 eruption. There were other super-powerful storms last year as well; all up, scientists observed a total of eight X-class flares in 2011. Most experts expect that the sun's restlessness will continue well into the new year and beyond. Solar activity waxes and wanes on an 11-year cycle, and scientists think the current one — known as Solar Cycle 24 — will peak in 2013. The $850 million SDO spacecraft, which launched in February 2010, is the first in a fleet of NASA efforts to study our sun. The probe's five-year mission is the cornerstone of a NASA science program called Living with a Star, which aims to help researchers better understand aspects of the sun-Earth system that affect our lives and society.